Akinwalere B.O. , Uche G.C. The study examined the effect of community financing institutions on cassava farmers’ income in Oyo State. The objectives were to examine the socio-economic characteristics of the respondents in the study area, identify governmental & non-governmental community financing institutions in the study area, and examine the effect of the financial institution programme on respondents’ income and to identify the factors affecting the accessibility of credit facilities among small holder farmers in Oyo State. A Multi-stage sampling technique was used for this study. In the first stage, a purposive sampling was used to select Lagelu, Akinyele and Ido Local Government Areas in Ibadan. Random sampling was used to select three communities from each of the three Local Government Areas and from each community, 10 respondents were selected randomly to give a total of 90 respondents of cassava farmers and processors. 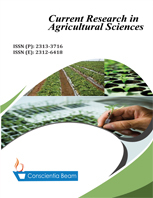 The analysis of the socio-economic characteristics revealed that majority of respondents that were involved in the cassava production and processing activities in the study area were males, the ages ranged between 17- about 65years and majority (38.9%) were between the ages 49-56years with the mean age of 49 years. Most (96.7%) were married with a high household size of between 6-10 numbers. The level of education of respondents revealed that majority (43.3%) had one form of education or the other which could enhance performance in production and processing activities. The primary occupation of respondents reveals that all of them were farmers, some are artisans and their monthly allowance ranged between less than ?20,000.00 and ?75,000.00 as most of them earn less than ?30,000.00. Chi square showed that there is a significant association between rural financing institution and cassava farmers’ income (?²=0.014, p=6). Also 57.8% of the respondents affirmed that the benefits received from the financial institution has a high effects on their standard of living which is affirmed by 43.3% of the respondents who agreed that their monthly income has increased as a result of the accessibility to fund. From the result, 53.3% of the respondents claimed that the high interest rate charged by the institution was the major challenge and 47.8% of the respondents affirmed that the Interest rate should be affordable as this will enhance accessibility of credits. This original study focused on the effects of community financing institution on cassava farmers’ income. It revealed the significant relationship between rural financing and cassava farmers’ income and also the major constraint of high interest rate facing the farmers in the study area.